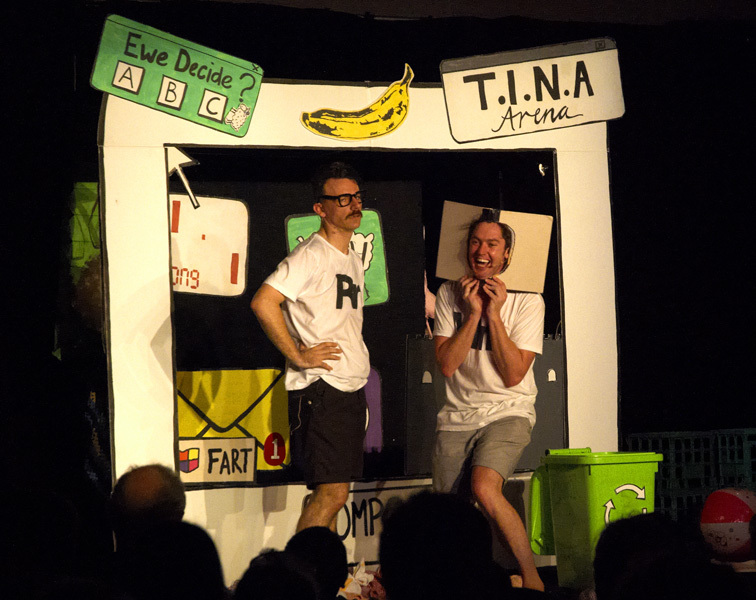 It was my first foray in to attending and reviewing a kid’s show but I was excited and really keen to see this award-winning smash hit duo from across the ditch in action. Described as “deliberately raucous, rude and very, very funny”, it already indicates that it is not a kid-exclusive show but one that can be easily enjoyed by adults as well. Meet Rich and Matt. Rich is the serious and responsible one while Matt is mischievous, playful and likes dreaming of LOLCats. They have created a show all about “compooters” which was meant to be performed inside a brand new computer but Matt broke it when he put cheese inside the DVD drive because he thought the mouse was hungry. This is the brand of humor that you can expect to be dished out along with accompanying colorful props, a host of pop culture references and gags aplenty in this manic and hysterical show. The stage, which houses a giant computer monitor, USB drive (“Uninteresting Stuff & Bits”) and a strategically placed recycle bin, is the duo’s playground for comedic lists as well as fun adventures. Letting your imagination run wild is a necessity and audience interaction and participation is an integral part of the show. It truly was a delight to see the kids just jump right in, eager to be involved. Highlights of the show for me: an onstage game of Pong (the world’s oldest computer game, and smell) followed by a more modern 3D version which involved the entire audience. I also really liked the concept behind the castle quest World of Woolcraft (which is “like World of Warcraft but with more ram”) where the audience are instrumental in how the adventure plays out with regular “decision time” sections. There is even an elaborate fight scene “rated S for Stupid” featuring stunt doubles. What impressed me the most is how effortlessly Rich and Matt had the kids eating out of the palm of their hands for the entirety of the show. They knew exactly which buttons to push to get the best reactions from the kids. The show is incredibly boisterous, beyond entertaining and will hopefully make you ROFLSHABOWLO (Roll On The Floor Laughing So Hard A Little Bit Of Wee Comes Out). It is the duo’s first time ever to our shores but I certainly hope it won’t be their last! I would pick these veterans at children’s theatre any day over the likes of The Wiggles and Barney. The Listies Do Compooters is perfect for children and adults alike, or as they like to call it, “kidults” (kids and their adults). This is a good starting point for kids who have not experienced the theatre before and great for adults who want to embrace their inner child for an hour. The Whimsical Banana rates The Listies Do Compooters: 5/5 bananas! Exceedingly fun, endlessly funny and just totes brilliant! The Listies Do Compooters is presented by TIME OUT Theatre and part of the October School Holidays Program. Tickets are only $15 and their last show is on the 9th October – this is a fantastic show for the whole family so you don’t want to miss out! For more information and to buy tickets, click here. To find out more about The Listies, check out their website.